ROCHESTER, N.Y. – Semrock announces new state-of-the-art filters for the efficient isolation of individual lines of high-power mercury arc lamps. Each filter obtains maximum throughput of the desired mercury line through exceptional passband transmission and careful optimization of the filter design. The non-absorbing blocking and fused silica substrate ensures that undesired mercury lines and other background light are effectively eliminated without the risk of filter solarization. The new MaxLamp™ family has been launched with mercury arc lamp filters to isolate the popular 365 nm i-line and the critical 254 nm UV line. These exceptional new bandpass filters offer an unprecedented average transmission of > 93 % and > 65% over the 365 nm and 254 nm bands respectively, yet with higher and wider out-of-band blocking than incumbent filters. MaxLamp filters are ideal for applications including spectroscopy, optical metrology, and photolithography mask-aligner and stepper systems. Both 50 mm and 25 mm diameter versions are in stock for immediate delivery. 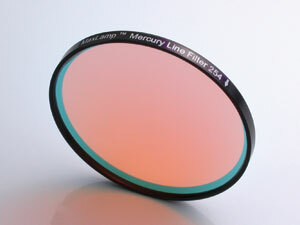 Made with Semrock's newly extended ultraviolet (UV) Ion Beam Sputtering technology, these UV filters share the transmission, spectral accuracy, and reliability of all Semrock filters – long-term testing shows that they will not "burn out" even after prolonged exposure to very intense UV source light. MaxLamp™ filters are covered by U.S. patents issued and pending.